Call 911 or 1-800-237-3633 to report a wildland fire. Required April 1-August 31, unless otherwise specified. Always practice safe burning. 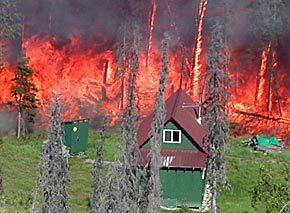 Protect your home and property from wildland fires! Contact a Forestry office for more information and a Firewise Alaska Brochure. The Rural Alaska Fire Prevention Movie is another helpful tool for learning about the importance of implementing FireWise practices. Involve your neighbors and become a Firewise Community. Fire Technicians, Fire Crews, and other interagency resources are crucial to the statewide firefighting effort. Firefighting aircraft (including helicopters, air tankers, and other fixed wing planes) are a key to success for firefighting and logistics in Alaska. Attention Pilots! Report fires to the nearest FSS or ATC facility. Please stay 7 NM away from all wildland fires and check for Temporary Flight Restrictions. The Division of Forestry (DOF) is one of three wildland fire Protection Agencies in Alaska. The Division protects much of the road-accessible area throughout the state. BLM Alaska Fire Service, the US Forest Service and DOF implement actions documented and directed by the Alaska Interagency Wildland Fire Management Plan. Note: Under agreements with DOF, cooperating fire departments also provide response to their communities and surrounding areas.